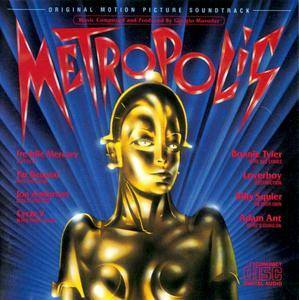 Metropolis is a 1927 German expressionist epic science-fiction drama film directed by Fritz Lang. Lang and his wife, Thea von Harbou, wrote the silent film, which starred Brigitte Helm, Gustav FrГ¶hlich, Alfred Abel and Rudolf Klein-Rogge. Erich Pommer produced it in the Babelsberg Studios for Universum Film A.G.. It is regarded as a pioneering work of the science-fiction genre in movies, being among the first feature-length movies of the genre. In 1984 Giorgio Moroder restored and produced the 80-minute 1984 re-release, which had a pop soundtrack written by Moroder and performed by Moroder, Pat Benatar, Bonnie Tyler, Jon Anderson, Adam Ant, Cycle V, Loverboy, Billy Squier, and Freddie Mercury.